The welcome arrival of Spring brings with it sunshine, warmer weather, and baseball. Last season was incredibly special for my son and our family because of the team we were on and the experiences that my son had. At a time when my son desperately needed something to hold on to and an outlet of his own, he found it in baseball. This season, we are on a new team but there is no reason to think his experience will be any different. We’re fortunate to be reunited with coaches who knew my son from when I coached him and the coaches’ daughter in tee-ball a few years ago. When we reached out to them to give them background on my son, they already knew about him and welcomed him wholly. Baseball has been good for my son. It provides him with an opportunity to be around other children, to have fun, and to get better at something that he enjoys. It has been good for me, too, by giving me opportunities to step back and let my son have his own experiences, his own successes and failures, and to let him figure out from those experiences who he is and who he wants to become. Last weekend, my son had a chance to pitch for the first time. He was excited. I was terrified. My brain immediately went to what could go wrong. His throwing accuracy is not the best. I was worried that he would be embarrassed. I was worried that he would walk everyone. I was worried that he would lose the lead and that his teammates and coaches would be disappointed. I was worried that he would like it but wouldn’t be asked to do it again. Before the inning started, I took him to the side to get him warmed up. He wasn’t great, but he wasn’t terrible. Then they called him up. As I walked him back to the field, I flooded him with instruction and advice. He threw a few more warm-up pitches with the coach and seemed to do ok, but I held my breath as the first batter came to the plate. The thing about my son is that he likes to play the part. He’ll see a movie of a baseball player and add the drama and flourishes to what he is doing, even if it’s not appropriate for his situation. On the pitcher’s mound, he looks towards first as if he is going to pick off the runner, not understanding that in his league, the players have to stay on the bag anyway. While he is on a base, he’ll crouch way down like the player did in the Jackie Robinson movie, even though it’s not practical to run from that position. I get frustrated because I think he could do a much better job if he could just focus on the task even though many times he simply can’t. But then he also might not have as much fun. On the mound, he threw a few strikes but a lot of balls. He walked a lot of batters and hit one. I could see him start acting instead of following his steps. I tried to get him to settle down before I realized I was likely making it worse. My frustration and anxiety were bubbling up as I watched our sizable lead shrink. 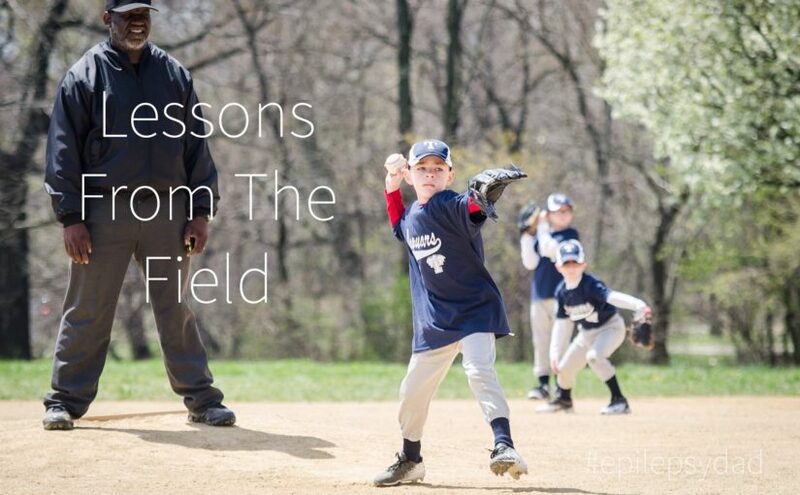 The coach was finally able to put in a different pitcher and I started to think about the conversation I would have to have with my son. Should we talk about not playing the part and just focusing on doing his steps? Should we talk about how they may not ask him to pitch again? Should we talk about how he can do better? When the inning was over, my son ran off the field with a big smile on his face. “Did you have fun?”, I asked. “That was amazing,” he said. After the game, my son and I played catch. He threw the ball right to me every time. I asked him what was different between throwing the ball to me and pitching and he said that when he was pitching, he was nervous because everyone was watching him. I realized that I was so focused on the mechanics of pitching and trying to get him to stay out of his head that I didn’t think to check in with how he was feeling going up to the mound for the first time. I was so focused on my anxiety and my frustrations that I didn’t ask about and acknowledge his. It’s hard. It’s hard to step back and to not be the “helicopter dad” always trying to protect him or to keep him on task. I do it with the best intentions. I want to protect him. I want to help him with the challenges his condition and the side effects of his medicine bring to his life. I felt like he needed me to do those things to function in the world, but deep down I know that it’s holding him back. He needs to be able to figure it out without me because I won’t always be here. And he needs to feel like he can do it by himself and for himself so that he develops confidence and a sense of worth. He simply can’t do that if I’m always trying to do it for him. On the way home, I asked if he wanted to pitch again and he said “absolutely.” The coaches agreed. Because where I saw anxiety and fear and failure, they saw an amazing kid do something that he had never done before with joy in his heart and a smile on his face. They didn’t expect him to do it perfectly his first time because they know that he’ll get better with experience. They just wanted him to have fun doing it. Once I got through my own baggage, I figured out that so did I.